A fellow May mom posted a picture of this dessert she was having that night and I fell in love. I thought about it all day and how I wanted to make it NOW. It consumed my mind to the point were I think I was actually drooling in anticipation. She kept saying how easy it was to make and that I should try it. I added macadamia nuts to it so there was more texture and it was heavenly! 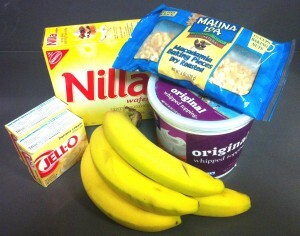 Make banana pudding as directed on the box by adding 4 cups of milk to the two pudding mixes and let it sit in the refrigerator for five minutes. In a large glass dessert or serving bowl place a layer of Nilla Wafer cookies down. Spoon layer of banana pudding over cookies. 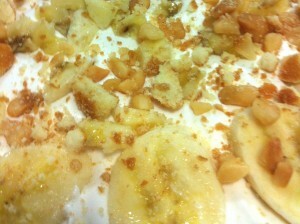 Lay banana slices over pudding and then cover with layer of cool whip. Sprinkle layer of cool whip with macadamia nuts. Repeat all steps until you are done with ingredients! I am drooling also….! I’ll make it this weekend but I’ll soak the biscuits in Khalua first,I think it will give it a very nice twist. Thanks for the recipe!! You know Mahina, your Grandpa’s favorite dessert was Banana Cream Pie. He could eat it every day. This recipe sounds very familiar to the “Banana Split Pie” that I make which is really onolicious! You do the same thing that you mentioned but I sprinkle over the cool whip crushed pineapple and drizzle with chocolate. Man oh man……winner, winner, chicken dinner! OMG. THANK YOU. Can’t wait to make it.